I don’t know how, but he’s standing here in the doorway. A torn piece of green silk sticking out of his pocket matching the fabric that I carry with me everywhere to remember him. My heart has been torn in two. I don’t know who I’m supposed to love. A man that has stolen my heart or my husband who I thought was dead. That can’t be possible. I found someone I could finally love. Someone I want to spend the rest of my life with. But I can’t love Alex. Not now. I have to let her go. It’s the only way I can save her. I just hope I’m strong enough to save myself. Picking up where we left off (cliffhanger of the century) in Aligned Volume 2...Ethan is alive...and he's back, but things sure are sketchy! It's a pretty good thriller going on right now, with a heavy dose of steamy. I groaned out loud when Alexa made her "choice" on who to stay with. I don’t like being led along too much in a book, sometimes I just wanna KNOW what's going on! This book is edging the line for me with not revealing the big question, but I’m hooked in right now and can’t let it hang. So I'll be on board for Aligned Volume 4 like a rabid dog. Book two left Ethan standing at the door. What a cliffhanger to go out with! Book three starts you right off at that point. Ethan's at the door and Landon's in the kitchen, should be an easy decision right? Nope. Ethan is alive and Alexa has no recollection of him at all. She should feel more for him, that is her husband. Alexa is forced to make a choice between Landon and Ethan. She does what she thinks is right. But things aren't as they seem. I need book four, NOW. I need to know how this one ends. Ms. Miles is doing a fantastic job holding my attention with this one. She leaves you saying wow at the end of each one, where yes, it's a cliffhanger, but you know your answers are coming. I have to say that with the cliffy at the end of book two, I couldn't wait to jump into this story to find out just what the heck was going on. Now, let me say that the story is quite interesting and there are a lot of secrets flying around and confusion for poor Alex(a) as she tries to figure out what she should do. I will say that the cliffy at the end of this one made me mad! I NEED to know what she found out!!!! I do also have to note that for me, this one wasn't as good as the first two because there was more of a triangle feel to the relationship(s) going on. I HATE triangles and I hated being pulled around, trying to not get mad at Alex for what she is feeling (because I had my own feelings, but I tried to stay with her and why she was doing what she was). In the end, I might have struggled through parts of this book more than the previous two, but I still enjoyed the story. I can't wait for the final part of the story!! For reviews & more info, check out our Aligned: Volume 1 post. For reviews & more info, check out our Aligned: Volume 2 post. 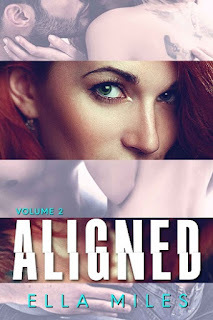 Reviewers on the Wicked Reads Review Team were provided a free copy of Aligned: Volume 3 by Ella Miles to read and review.